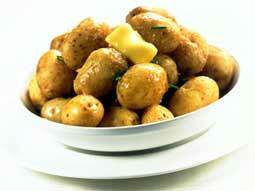 One of the most popular staple foods in the world, a wide variety of different potatoes is available. They are usually divided into two different types: waxy and floury. Waxy potatoes hold their shape well when cooked and are best for using in layered potato dishes or for boiling and serving with butter. Waxy potatoes are not very good for mashing. Varieties include Marfona (which is particularly good for baking) and Nicola. 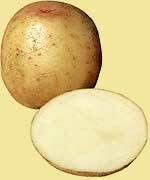 Floury potatoes are particularly popular in the UK and are good all-rounders as they are more suitable for chipping, baking, roasting and mashing. But they are no good for boiling as they fall apart during cooking. 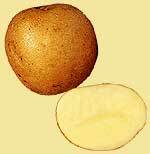 Floury potatoes include King Edward and Maris Piper. 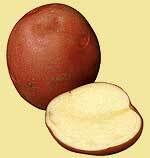 A popular oval-shaped red-skinned potato, with a pale creamy flesh, firm texture and good flavour. Desiree potatoes are good for roasting, chipping and mashing. 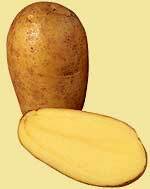 A white skinned potato with a pinkish tinge and a creamy, pale yellow floury flesh. King Edwards are suitable for mashing, roasting and baking. With its light yellowy beige skin and smooth waxy texture, Marfonas are ideal for baking. 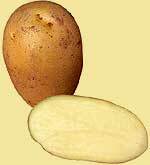 One of the UK's most popular potatoes it has a creamy skin and flesh with a floury texture. Suitable for chipping, baking, mashing and roasting. 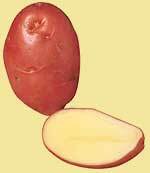 A popular new potato with a waxy texture and buttery flavour. Ideal for boiling and roasting. A cream skin and flesh identify the Nadine variety, with a firm and waxy texture. 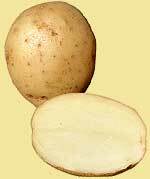 A red skin and cream flesh characterise the Romano varierty, with a soft, dry texture. White skin and white flesh are characteristic of the variety, with a firm, moist texture. 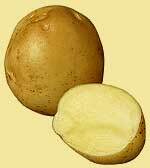 A popular variety, this pale yellow skinned salad potato with yellow flesh, has a firm texture and is excellent for boiling and use in salads. 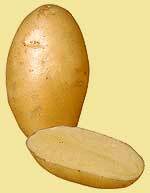 This is a Speciality/Salad Potato variety. This white skinned variety with pink eyes, has a cream flesh. With a soft, moist, waxy texture. These potatoes are moderately firm with a dry texture. Yellow skin and a light yellow flesh are characteristic of the variety. 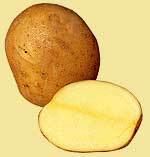 Estima potatoes have a light yellow skin and light yellow flesh. A firm moist texture. With their yellow skin and flesh, this variety have a dry and firm texture. Potatoes are very versatile; they can be cooked in many different ways and served boiled, baked, mashed, sautéed or chipped. They can also be included in dishes such as stews, soups, casseroles, pies and bakes. 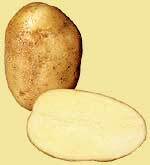 Small new potatoes can simply be washed or scraped, Salad potatoes need only washing before cooking and main crop potatoes should be peeled before cooking or if cooking without peeling ie baking potatoes, wash and scrub them thoroughly first. 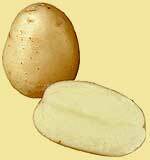 Potatoes can be boiled, baked, chipped, fried, mashed or roasted. To boil potatoes, bring a pan of salted water to the boil, add the prepared whole small potatoes or even-sized potato chunks and cook for 15 - 20 minutes or until tender. To bake potatoes, preheat the oven to 200°C, gas mark 6. Prick the cleaned potatoes several times with a fork and place in the oven. Bake for 1 - 1½ hours or until tender. To roast potatoes, preheat the oven to 200°C, gas mark 6. Part-boil prepared even-sized potato chunks for 5 minutes in boiling salted water. Add the drained potatoes to a roasting tin and coat in hot oil (or fat) of your choice. Roast for approximately 50 minutes, basting occasionally with the oil, until crunchy and golden brown. To make chips preheat the oil, preferably sunflower, corn or vegetable to 190°C. Meanwhile cut the peeled potatoes into even-sized chips, rinse under cold water then dry thoroughly. Gently add the chips, to the oil and fry for 5 - 6 minutes until softened not browned. Lift out the basket and increase the oil temperature to 200°C. Return the chips to the hot oil and fry for 2 - 3 minutes until golden brown, drain well and serve immediately. To mash potatoes, boil even-sized potato chunks for 15 minutes or until tender. Drain then mash with hot milk and seasoning until smooth. Potatoes can also be shallow fried in the oil of your choice - cut into either even-sized slices or cubes and fried for 20 - 30 minutes until tender. 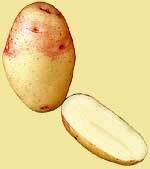 Unwashed potatoes should be stored in a cool, dark, frost-free and dry place for up to 1 month, but not in the fridge. Washed potatoes should be stored in the fridge for up to 1 week. Remove potatoes from the plastic bag that they are usually sold in and transfer to a brown paper bag if possible. Potatoes should not be exposed to light as they can turn green and start sprouting.